Left to Right: Kamal Bistari, Daniel Rafique, PADI Master Scuba Diver Trainer and owner of Kids Scuba – Syed Abd Rahman, Muhammad Fadhel and Shakir Ashraff. 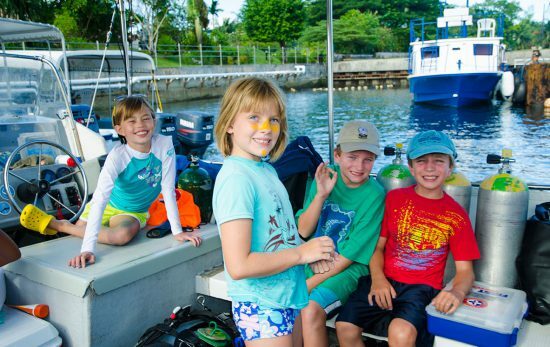 Kids Scuba in Kuala Lumpur, Malaysia recently hosted the successful “A Day for Sharing” program, where they organised aquatic experiences for kids, teenagers and youths from two local orphanages. Following on from this successful event, four orphan boys aged 18 – 21 years old, were individually selected for a ‘Zero to Hero’ program to educate and train them from PADI Open Water Scuba divers through to PADI Divemaster level. The four selected were Kamal Bistari, Daniel Rafique, Muhammad Fadhel and Shakir Ashraff who were trained for their confined water training by the Kids Scuba dive team during weekly pool sessions – under the direct supervision of Hj. Syed Abd Rahman – PADI Master Scuba Diver Trainer. The boys sat and completed their PADI knowledge reviews, quizzes and exams before their trip to Tioman Island for their open water dives at the end of March 2015. Together with The Kids Scuba team, the youths dived with B & J Diving Center, a PADI 5 Star Instructor Development Center in Kg Salang, Tioman. The boys participated in shore and jetty dives at the Salang Jetty, followed by boat dives to Soyak and Renggis Island in the Tioman Island Marine Park, assisted by PADI Divemaster, Mr. Khairul Azizi. After a 3 day/2 night dive trip, the final night saw the four boys graduate for successfully completing their PADI Open Water Diver course. “Our congratulations to the boys on their achievements, declared Syed Abd Rahman”. 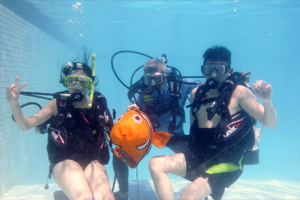 “Their next trip will be Tenggol Island in Terengganu to complete their PADI Advanced Open Water Course”.